So, my first attempt at a Chaos Warp Team did not work exactly as planned. It turns out that we played the Captain America/Chaos Warp interaction completely wrong. Captain America should only have done a single point of damage for each Warp trigger. It would not have worked as I wrote it last week. That doesn’t mean I am not going to try again. Now, this one may have a little controversy associated with it too. We will get to that a little later, but it didn’t really come into play tonight. However, it does affect how the Team plays overall. So, back to the drawing board on this one. I kept some pieces intact from the previous build, but shifted the focus on how damage will be dealt. With that out of the way, let’s return to the Warp Zone. The Team: Warp Zone Two Point Oh. Obviously, Chaos Warp and Morph were still the central part of this Team. Create Food and Water was still there for Bag manipulation. Kate Bishop was to keep Morph in the Field. The rest of the Team was scrapped from the previous build to try something new. This one was going to centre on Multiple Man. He provided a few options for this Team. First he is ramp personified. His Swarm ability is great and the max 6 dice are very helpful as well. He would also become Bag fodder for Chaos Warp when the time was right. To make the best use of Multiple Man, I needed something that provided some control over what he did. Enter Rip Hunter. Early game, he would allow Multiple Man to be more energy than I know what to do with. If Swarm fully trigger, Multiple Man becomes 10 energy plus whatever else I rolled. This interaction is also where the controversy comes into play. My theory was that Rip Hunters allows you to “place” dice instead of having to roll them. It does not specify when this occurs, just that the dice have to be drawn. Chaos Warp says to DRAW all of the dice from your bag. If the interaction works as intended, I can place the Multiple Man dice on their character face to guarantee that damage. The counterpoint was that Chaos Warp requires the dice to be rolled in order to trigger. 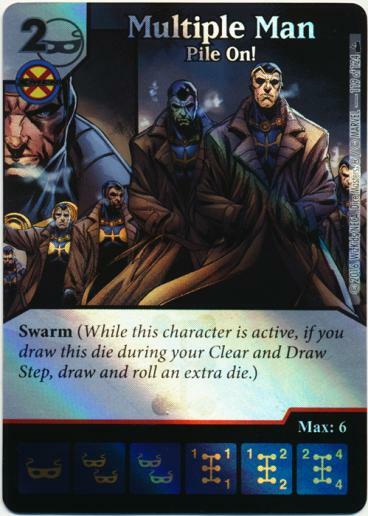 By placing the Multiple Man dice on the desired face, it would have no effect since it is not actually rolled. The rest of the build involved some protection and maximizing the damage of Chaos Warp. That is where these guys came into play. Bishop is pretty much the best option to keep Warp from hurting me. Makes it a little one sided when I choose to trigger it. Two-Face is the best option to maximize the damage from Warp. If the output is large enough, at the cost of 2 life I can double it. The last parts of the Team were to make some of these purchases easier. I went there… PXG. I personally dislike this old school tool, but it works well with this Team for a couple of reasons. First is obviously energy. The second is to try and filter Sidekicks out of the Bag to again push Warp in my favour. Finally, I added in Rip Hunter’s Chalkboard. Again, it served its main purpose, but also the action itself could be beneficial here. If my Bag was going sideways, I could empty it quickly and use Cake to refill it. Life gain never hurts either. Bye! Chaos Warp is undefeated!!! Up against a classic Teen Titans build from our very own Birthday Boy, Mike. It took a little time to set things up here, but once Rip hit with Multiple Man I had so much energy that I could not spend it all. The hardest part for me in this game was getting my lone Multiple Man out of the Field. Eventually he got KO’ed and the swarming stopped. Then I was able to focus on the Warp. 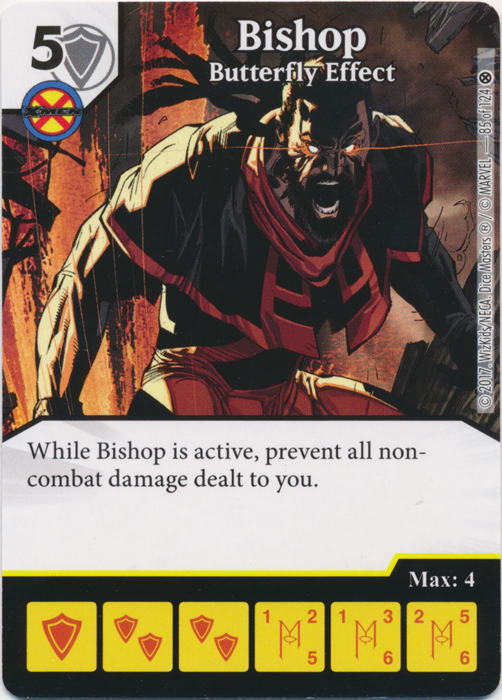 Bishop kept the Titans at bay by preventing the Starfire burn damage. This is when the controversy first came up, as my Chaos Warp draw brought out all 6 Multiple Men. In the interest of not making life difficult, we decided to roll the dice instead of placing them. It did some damage, but not enough to justify using Two-Face. The second time around, this was not the case. It was ample damage and Two-Face’s ability made it worse. Full disclosure, Mike did a ton of bag burn damage to himself in this game (which he is known to do). I think that hurt him more than Warp did to be honest. This one was against our resident youngster. I tried my best to explain PXG to her, but it was a little difficult for her to grasp how to use it best. Pretty standard build-up here: Multiple Man to Rip Hunter to Bishop to Morph. Have stupid amounts of Masks with Multiple Man to either buy, PXG, or Bishtraction. I actually forgot to buy Two-Face here. I used Morph a few times to push through the Warp damage. This was definitely a more interesting Chaos Warp build compared to my previous one. Bishop is pretty much necessary with Chaos Warp to prevent the damage to yourself. Without him, it is a little too… chaotic. 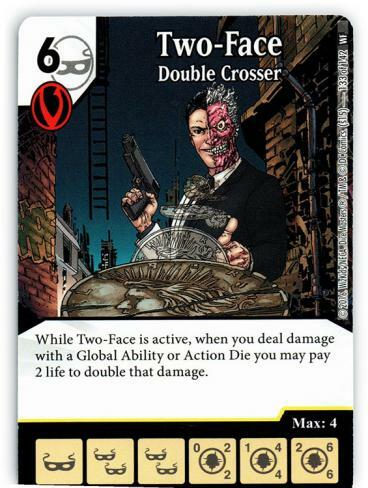 Two-Face was a nice addition to the Team, but was not absolutely necessary. He felt a little too much like a “win more” card (a weakness that I do admit to liking more than I should). The Team worked well without him, and would open a slot for something else. The only real question is the Chaos Warp/Rip Hunter interaction works. 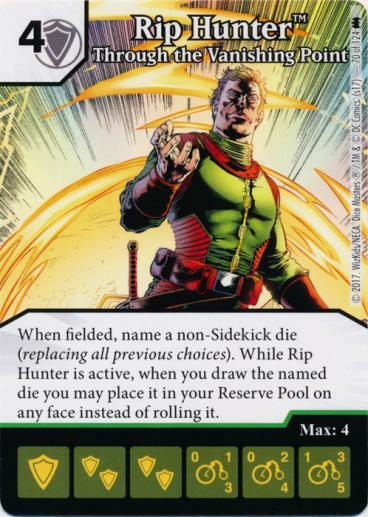 Does Rip Hunter allow you to skip rolling the dice he names? Does this occur whenever dice are drawn? As written, it seems that it does. However, this one is a little tricky to call. It is a question that I have submitted to the Wizkids Rules Forum. We’ll see if this one gets answered or not. I think this now ends my Chaos Warp experimentation. It is 100% a one trick pony type of a build. Don’t expect some super competitive build here. This version sure worked better than my last one. Jo Vega ran a pure Chaos Warp/Vicious Struggle Team in the latest WDA, and that worked too. It is a really narrow focus to make Warp work well. I recommend you try it out. It has some really interesting interactions going on. What are your thoughts on Chaos Warp? How would you rule the interaction with Rip Hunter? Do you have a different Chaos Warp build? Let us know in the comments below.